Rainwater Harvesting is the process of collecting, moving and the storing of rainwater for future use either in the home or in the garden. We know that water is the Earth’s most vital and valuable resource as it supports life, and as yet there is no economical substitute for it. While there may be thousands of square kilometres of water on the Earth, less than 3% is readily available for human use, and this small amount will continue to decrease as the world’s population expands. Bringing rain into your life and garden has many positive advantages with the biggest advantage of rainwater harvesting is that the rainwater is free!. Also the collected rainwater contains no chlorides or chemicals, is pH neutral with zero hardness, (soft water) and contains fewer salts and solids than mains city water, so is much better for the garden and plants. Harvesting rainwater from the clouds instead of tap water can also help keep your garden looking greener. Rainwater Harvesting and Collection makes sense were there is a history of water shortages during the dry summer months. The rainwater collected and stored can be a valuable supplement to domestic water consumption and the irrigation of plants in the garden. Even in hotter and drier climates, quite a lot of water falls from the sky which can then be collected and stored. The collecting of rainwater is different to grey water and wastewater collection. Grey water is water that has been previously used and collected from sinks, showers, washing machines, dishwashers, etc. and as such contains large amounts of dissolved soaps, detergents and bleaches. Rainwater is clean water as it comes from the clouds and is therefore not reused, recycled, reclaimed or classed as it is with grey water. Rooftop rainwater harvesting systems are very easy to construct, operate, and also maintain. A rainwater capture system can be as simple as your roofs gutters and downspouts channelling the water into a water barrel or storage tank below. Installing gutter screens can also help remove most of the larger leaves, sticks and debris from the water before being stored. This involves capturing the water running from roofs, gutters and/or the watertight surfaces of buildings, offices, and schools, etc. upon which the rain falls. Water intended for drinking should ideally not be collected from those surfaces containing weather proof coatings, asphalt compounds, asbestos sheets or lead for obvious reasons. The channels, gutters, downspouts or pipes that transport or convey the rainwater from the catchment area, that is the impermeable surface upon which the rainwater falls, to the water storage system should also be drinking water friendly such as copper or plastic piping. However, it is advisable that any water collected for drinking should first be tested. Rainwater is generally clean when it falls from the sky so requires minimal treatment before being used for washing, laundry or general garden use. Rainwater that is collected for drinking purposes should be treated first by passing it through a mechanical filtering and disinfection system before it reaches the storage tanks or even the taps. Most water filters used for rainwater harvesting contain a plastic screen to remove large leaves and debris, a fine membrane filter to remove smaller particulates, and a carbon filter to remove any organic matter. Rainwater can also be filtered and treated naturally using the bacterial activity of carefully selected plants. Once collected and filtered, the harvested rainwater can then be stored in water storage tanks, barrels or pits. The proper sizing of rainwater storage tanks or barrels is important because you need to know roughly how much of the rainwater you expect to collect from your capture system and how much of the water you expect to use. Underground tanks and pits have the potential advantage of installing a larger storage capacity with more water available to use between rain events. However, they can cost more to excavate, maintain have limited access and may need a pump to get the water out of them. Also an underground water storage tank as well as being sealed to prevent the entry of insects, dirt and run-off water, may require to be properly vented into the atmosphere preventing the build-up of air pressure or a vacuum within the actual tank which all adds to their overall cost. As well as water use, water storage tank considerations include size, cost, location and aesthetics. Closed or covered water tanks are preferred as they help to prevent evaporation and exclude sunlight which can promote algae growth. Above ground storage tanks should be ultraviolet resistant preventing damage by the sun. Smaller tanks, water butts and rain barrels used for rainwater harvesting can be painted or decorated to provide protection from the sun, or camouflaged to make them blend-in with their surroundings, or to be just a fun and interesting thing to look at in the garden. Rainwater storage tanks can be raised above ground to increase water pressure and to take advantage of gravity flow. Raised tanks also allow for easy access to taps (faucet) and valves at the bottom to fill buckets and garden watering cans. Multiple tanks can be connected together to increase storage capacity but all external water tanks and pipework will require protection from freezing in the winter months and from UV degradation. Once collected and stored, the rainwater needs to sent or distributed to where it is needed. Above ground water tanks, butts and barrels usually have a tap (faucet) or valve located near their bottom to remove the water for small uses, such as filling buckets or watering cans, etc. These taps and valves are generally located about 6 inches or so above the bottom of the water butts and barrels to allow any sediment to settle. 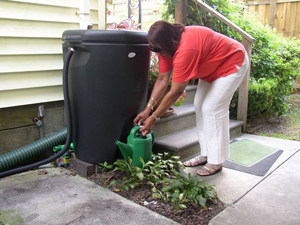 Rain barrels and water butts deliver their stored water by gravity, but if you use the water for the garden hoses or a long or vertical distance from the storage, a pump may be needed to supply adequate water pressure. Mains powered pumps or solar powered pumps can all be used as part of your rainwater harvesting system. Pipes, pumps, and valves allow the harvested rainwater to be used both in the garden and the home. An electric pump connected to a garden hose can transport the pressurised water around the garden via solid or perforated pipes or a manual drip system for irrigation. Most watering irrigation systems require pumps to provide the necessary water pressure to move the water long distances or uphill to water the plants in all corners of the garden. Without a pump the water will be pressured by gravity. In addition to pumps, fine mesh or cartridge filters can also be installed to remove any particles present in the water including dirt, silts, organic particles and other such debris that may have formed or entered the storage tanks before being pumped. As well as filtration, the rainwater could be treated and/or disinfected in order to meet the requirements of the end use if used for drinking. We generally think of rainwater as being clean when it falls from the sky with the perception that this fresh, clean supply of water will always be in abundance providing us with a constant renewable energy source. But both the environment in which the rainwater falls, and its location as well as the materials used to construct a rainwater harvesting system, can all affect the quality of the harvested rainwater. Then more significant than the quantity of the captured rainwater is its quality. With the proper filtration and treatment, rainwater harvesting can provide us with a good clean supply of drinking water. Chemical or ultra violet (UV) disinfection and treatment is necessary if you intend to use the captured rainwater for drinking or other such domestic purposes. While filtering can removed debris, dissolved solids and very fine particulates to improve taste, disinfection further improves the waters quality by removing micro-organisms. The disinfection of harvested rainwater for use as drinking water can by either by chemical injection, ozone generators, or by a UV light. Chemical treatment using chlorine or purification tablets kills-off any micro-organisms and leaves a small amount of the chemical in the water to help maintain the water quality. Most people who use rainwater harvesting systems prefer disinfection by ultra-violet (UV) light because it does not leave any chemical residuals behind in the water. The collected rainwater flows through a sealed chamber or tube containing UV light bulbs. This disinfects the water by applying a certain amount of UV light intensity over a set period of time to kill the micro-organisms. Also, depending upon the type of rooftop catchment material used, that is uncoated galvanised or metal panels, concrete, gravel or wood shingles, the pH of the rainwater can either be increased or decreased when it washes across these roof surface. Then the regular pH testing of the drinking water may be required as pH values between 0 and 7 means the water is acidic, while pH values between 7 and 14 means the water is alkaline. Values between 5 and 7 are acceptable. We have seen here that harvested rainwater is an alternative source of water for our homes and gardens and which can be used to reduce the consumption of mains water. Many of us enjoy our green lawns and beautifully landscaped gardens as well as fresh produce from our own back yard and garden. Rainwater harvesting will give us an unlimited supply of water to do just that. Harvesting rainwater through a simple collection of tanks, barrels and water butts for use in watering our lawns and gardens helps decreases the burden on our limited and valuable fresh water supply by allkowing for your own freshwater production. The using of captured rainwater can also result in a cost savings reducing our domestic water bills and enhancing our awareness of the value of fresh clean water. Although rainwater may be captured from many different types of impervious areas, such as rooftops, driveways, patios, etc., the rainwater captured from rooftops can be directed to rain barrels and water butts for use in the garden and landscaped areas for use later. This way rainwater is returned directly back to the environment by watering the plants rather than entering the storm water drains and sewage system. The installation of a rainwater harvesting system is more economical in those areas where the mains water supply is expensive, unreliable, or of a questionable quality. But whatever your location, water situation or the size of your wallet, a good rainwater harvesting system can be installed almost anywhere in your garden for a cheaper and cleaner water supply. The harvesting of rainwater can prevent flooding and erosion on your property by turning storm water problems into a reliable water supply asset by slowing down the run-off water from roofs, etc. and allowing it to gently soak into the ground. Then the harvesting, storage and use of rainwater and also storm water as part of a safe and effective rainwater catchment system can help us solve some of the drinking water, flooding and energy challenges throughout the world. To learn more about rainwater harvesting, or if you just want to explore the advantages and disadvantages of how rainwater harvesting works, then Click Here to get your copy of one of the top books on rain water collection and harvesting direct from Amazon today to provide the resources, expertise, education and training needed to install your own water catchment system. Hi all, until last week I had been using city water from the garden faucet to water my Cucumbers, I’m in very hot sth FL and that seems to be the only thing that grows in the intense summer heat. I had to leave for a short week, so set the 4 container plants in centre of garden and let my sprinkler system ( well water ) do it’s job, daily. Upon returning I was surprised at how well the cucs looked, good growth, no disease,etc. I’m wondering if certain kinds of water are better for growing veggies than others, well vs city vs rain? Any thoughts.